Officials say an outbreak of norovirus at a San Francisco school has caused at least 57 people, 53 students and four teachers, to be sick. The San Francisco Chronicle reports San Francisco Unified School District spokeswoman Gentle Blythe says McKinley Elementary School staff noticed students with symptoms of the infection when the school reopened after winter break. 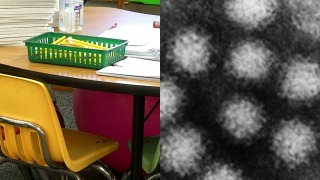 Several Northern California schools have temporarily closed due to the spread of norovirus. The South Bay Union School District closed schools last month when 130 students became sick. Blythe says there are no plans to close McKinley. Norovirus is a contagious virus that causes the intestine and stomach to swell. Heath Department officials say it is crucial to disinfect the environment to prevent spreading if someone with the virus vomits or has diarrhea.